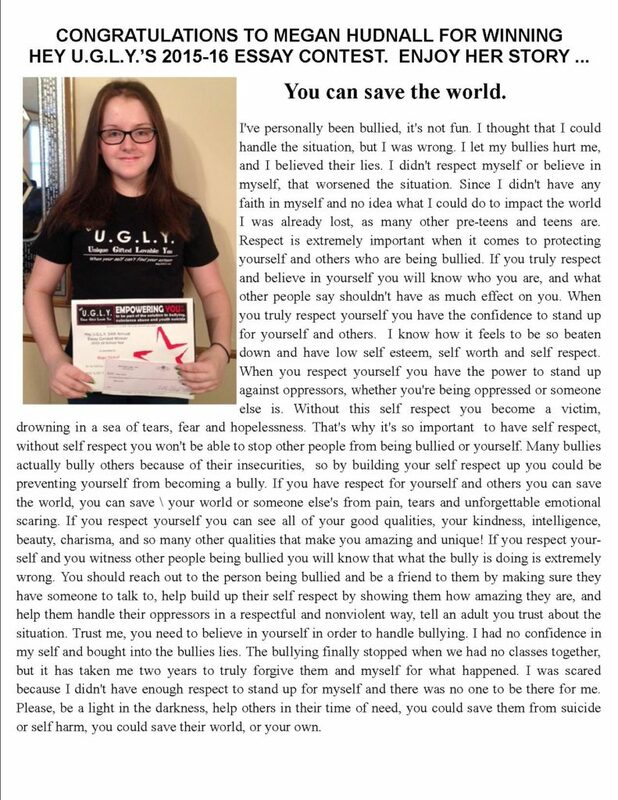 Essay Contest – Hey U.G.L.Y. Please scroll down to read and follow our rules and regulations for submitting your essay. All entries due by May 31, 2019. All entries, 500 words or less, must be original, legible, double-spaced in WORD format or pasted in the body of an email. Email your entries to PreventBullyingNow@heyugly.org. Make sure subject of email is: Essay Contest. Please include entrant’s name, age, grade, school, home address, and phone number on the entry. Contestants may enter contest more than once. Must be 7 – 17 to enter. Void where prohibited by law. All entries must be emailed no later than May, 31, 2019. All entries submitted for judging will become the exclusive property of Hey U.G.L.Y., Inc. and will not be returned to entrants. To determine the winner, all entries submitted will be judged on clarity of message, sincerity, composition and originality. An independent panel of professional writers and journalists will conduct judging. Judging will take place on or about July 15, 2019. Decisions of judges are final. Winner will be notified, by phone or mail, no later than September 15, 2019. First Prize: $100.00 cash. To receive a written letter listing the winning entry, send a stamped, self-addressed envelope to Hey U.G.L.Y., PO Box 2142, Michigan City, IN 46361 by October 15, 2019. Winner need not be present to win. All taxes and any expenses not indicated herein are the sole responsibility of the winner. Any prize returned as undeliverable will be awarded to an alternate winner. Entry and acceptance of prize constitutes permission (except where prohibited by law) for sponsor and anyone it may authorize to use winners’ names, photographs or other likenesses, biographical information, work, hometowns and statements concerning the contest for purposes of advertising and promotion without compensation to the winner. Employees of Hey U.G.L.Y., Inc., its affiliated companies, participating partners and their respective advertising, promotion and production agencies and their immediate families are not eligible. Not responsible for typographical or other errors. All prizes are guaranteed to be awarded.